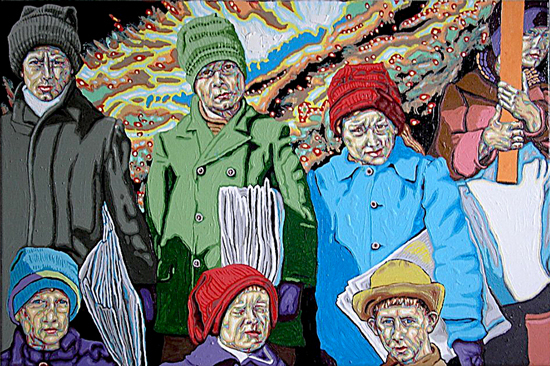 Small Ontario cities are the crucibles of culture and creativity, and they are the places that artist John Boyle finds most comfortable and stimulating. Currently he resides in Peterborough, where the Balsillie collection of Roy Studio photographs of community life in the late nineteenth and early twentieth centuries is an outstanding resource. Half of the small 5" x 7" ink drawings in the exhibition are based on a single photo of people gathered for the laying of the corner stone of the Market Hall and clock tower, just a block-and-a-half from the artist's studio, in September, 1889. The other half of the drawings show some of the dearly loved animals in the town's Riverview Park zoo. Two new oil paintings that complete the show again draw on the Roy Studio pictures, and show young nineteenth century swimmers and early twentieth century newspaper delivery kids, both in otherworldly settings. "I have always been obsessed with people and community. People out of time and animals out of place permit a re-evaluation of the human condition." John B. Boyle was born and educated in London, Ontario. In the 1960's and 1970's he lived and worked in St. Catharines, first as an elementary school teacher, then as a professional artist. In the 1980's and 1990's he lived in the hamlet of Elsinore near Owen Sound. He currently resides in Peterborough. He is a founder of the Niagara Artists' Centre, and is an elected member of the Royal Canadian Academy.